In this imaginary world, you wake up and you think about your day, not your size. You have thoughts of what you want and need to do. What you’re looking forward to, or what important thing is happening. You’re not beating yourself up, you’re not feeling disgust, and you’re just – you. When it’s time for breakfast you’re willing and even happy to find something delicious and satisfying to eat. You feel glad that you’ve learned to eat to fuel your body and that what you eat tastes good to you. You’re trusting and confident that it’s okay to eat and you don’t have to overthink it anymore. There is more to life than food and weight – so much more. I’ve been learning about, teaching, and living Intuitive Eating for about a decade. To me, and to others I know who eat this way, it’s THE game changer for anyone who lives the diet cycle. What is it? It’s a book. It’s more than a book – it’s a lifesaver. Go now, and read it. Get the latest 3rd Edition. I wrote Savvy Girl, A Guide to Eating – the journey about a past client and her work with me to become an Intuitive eater to help women in a dieting mindset discover Intuitive Eating. That was and still is my sole purpose. What’s the deal with it? Intuitive Eating teaches you how to eat and think about food normally again. 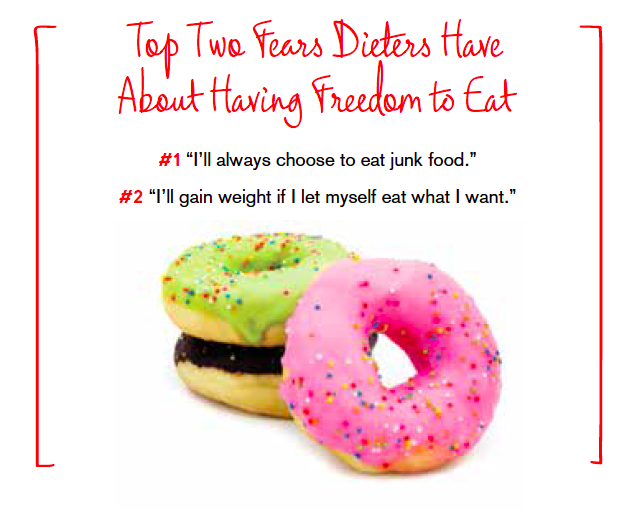 It will allow you to experience the many great gifts you get when you stop restricting. There are rewards reaped when you start listening to your body’s hunger and fullness cues. Perhaps even more important than that, it helps you discover that feeling satisfied is what we’re all really after. It will literally teach you what you already know deep down – that dieting is temporary, and all we get out of it is louder hunger.